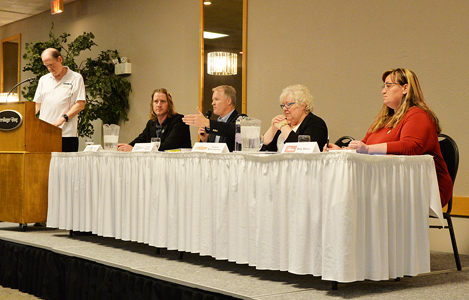 Taber-Warner voters were given the opportunity to probe the viewpoints and platforms of candidates during Taber’s All Candidates Forum hosted at the Heritage Inn on Monday evening. In the 2019 provincial election on April 16, four candidates are vying for the votes of constituents: Jason Beekman for the Alberta Party, Grant Hunter for the United Conservative Party, Laura Ross-Giroux for the New Democratic Party, and Amy Yates for the Alberta Liberal Party. To open the debate, candidates fielded questions from the floor on climate change and the carbon tax, as well as property taxes related to education. Municipal District of Taber councillor Tamara Miyanaga asked what each party hopes to do to help rural Alberta recover and prosper. Hunter promised that a UCP government would eliminate Bill 6 and replace it with options that work more effectively for small farmers. Former town councillor Ross-Giroux talked about the huge potential for agricultural innovation that exists right along the Highway 3 corridor. Liberal candidate Yates, who hails from Coaldale, staunchly defended legislation that protects farm workers. Pat Bremner, Taber’s local trustee with Holy Spirit Catholic School Division, questioned what each party’s viewpoint is on locally-elected school boards. UCP candidate Hunter agreed with Beekman while attacking a heavy-handed bureaucratic system that segregates critical decisions in Edmonton. Taking a more conciliatory view, the NDP’s Ross-Giroux wants a relationship with Edmonton on education decisions. Yates for the Liberals would like to see more municipal involvement in education decisions at the grassroots level. Barnwell Mayor Del Bodnarek sparred with the UCP’s Hunter over electricity de-regulation, with Hunter arguing that rising costs are a result of previous government choosing not to de-regulate transmission and distribution. “The truth is you have three parts to your electricity bill — transmission, distribution and retail,” said Hunter. Bodnarek squared off against Hunter as the Alberta Party candidate for Cardston-Taber-Warner in 2015, taking in 3.1 per cent of the vote in the riding during that election. Always a critical issue for many voters, prospects for a privatized health care system in Alberta were debated among candidates. The NDP’s Ross-Giroux was blunt in her assessment of the idea. Privatizations in the province have done nothing but add costs for citizens, argued the Liberal Yates. Alone among candidates, the UCP’s Hunter signaled a need to look at other jurisdictions for better ideas about what works elsewhere. Other topics covered by the candidates during question period included drug costs and programming, the recovery of the oil industry, the nature of GSAs (Gay-Straight Alliances) in schools, public/separate school systems or a one-size-fits-all model, MLA recall legislation, pipelines, minimum wage, and Alberta’s future role in Canada’s federal system.